Our Man's Trouser Socks are designed for that "fashion & elegant" look when trying on shoes. 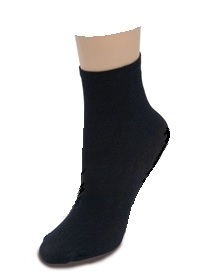 Designed and finished with an elastic top, this over the calf try on sock is guaranteed to stay in place and not roll down when distinguished clients try on shoes. This model is used in better shoe stores everywhere. Comes in black only and it packed 24 units (12 pairs) per box.